Today, as usual, has been busy so I need a super easy recipe for SCI diet that fits our schedule. Oven roasted Ratatouille is so quick and versatile that it’s a tasty must in our household. Quick recipes are great for all busy carers but this particular method is so simple that you’ll love it, also because it tastes delicious too ! 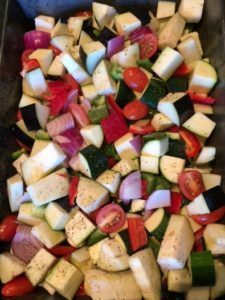 Put all prepared vegetables into a roasting tin, scatter whole cloves of garlic throughout the tin and drizzle with olive oil. Season with salt and pepper. Pop tin into a pre heated oven at 200 degree C and roast for 35 mins. Serve with meat of your choice or on cous cous, I am presenting the slightly cooled Ratatouille as a salad with rocket leaves and feta cheese. If you fancy a variation you could add diced squash into the roasting tin. Tear up herbs to scatter on top to your taste. I bought all the vegetables economically as in season which makes this a reasonable dish for the family. 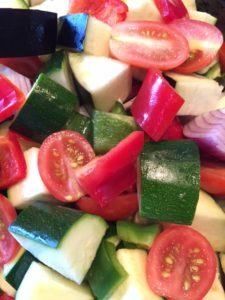 I really love that the preparation is so simple as all the vegetables are diced into chunks and I love that Ratatouille can be eaten as a side dish or as a main course salad or with cous cous or, or ….the ideas are endless. We will have enough Ratatouille left over for roasted vegetable wraps for lunch tomorrow. Perfect with no effort at all! 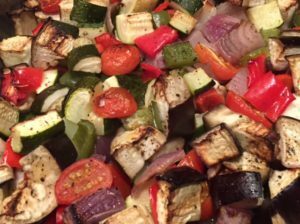 This entry was posted in SCI Diet and tagged Recipe, Roasted Vegetables by everydaycarer. Bookmark the permalink.